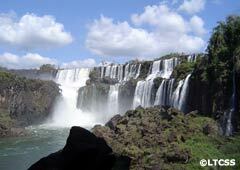 The Iguazú Falls, along with the Perito Moreno Glacier, are the greatest tourist icons in Argentina. Scroll through this virtual guide and get all the information you need to plan your trip. 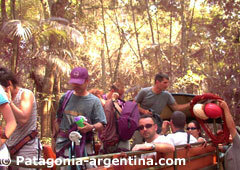 Jungle… the sounds of wild animals and the backdrop of verdant leaves. 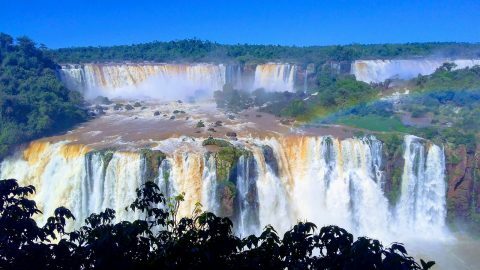 Extremely beautiful, an earthquake for the senses, a life-altering experience awaits you at the Iguazú Falls, in the north east of Argentina, where a triple frontier is shared with Brazil and Paraguay. The waterfalls assault the visitor with their torrents, so grand and loud that we, mere mortals, are confronted with the smallness and brevity of our lives. 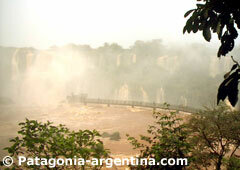 Lush green, gigantic leaves and flowers, red earth, the eyes of animals watching us, a heat that pierces the body. 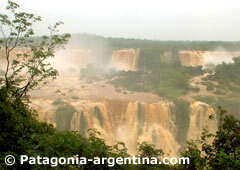 In a guidebook an expert guide from Iguazú asked himself why the waterfalls are not as appreciated in Argentina as Patagonia and why the snow and ice is considered to be more “elegant” than the tropical heat of the jungle. We can’t say if this is true, but we can assure visitors to our country that this prejudice is unfounded. If you can combine the ecstasy of a visit to the Glacier Perito Moreno with the euphoria of a walk towards the waterfall called the Devil’s Throat, you will be a privileged person. An experience not to be missed.